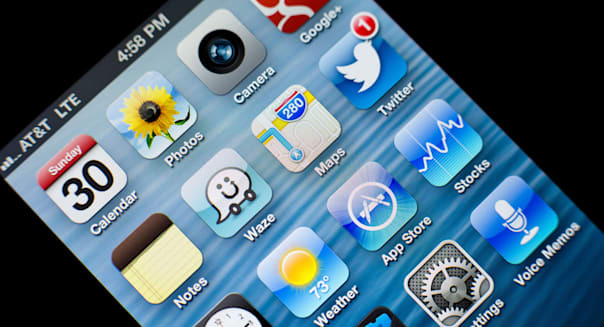 If you're like most Americans, apps play an increasingly important role in your life. Those mini-programs embedded in your smartphone might help you track spending, count calories, monitor daily exercise, transfer funds and so much more. Pretty useful stuff -- but are we becoming dangerously dependent on them? A 2013 survey of 1,000 smartphone owners by the Apigee Institute, a research and strategy organization focused on helping companies master the world of apps, found that more than half of 18- to 24-year-olds say they would not be able to wake up on time without apps. Almost four in 10 smartphone owners use shopping apps once a week or more, and more than half make purchases using apps when they're inside another store. Bryan Kirschner, director of the Apigee Institute, says none of that is necessarily a bad thing. "On balance, apps enrich our lives and they make us more productive," he says. He adds that someone could take it too far and become obsessed with apps, but for most people, apps have a positive influence on their lives. He also points out that people of all ages are using apps to a significant degree: The Apigee survey found that 80 percent of 50- to 64-year-olds said owning a smartphone (and using the related apps) changed the way they interact with friends. People also increasingly use banking apps instead of visiting brick-and-mortar branches. Just one in three people under age 40 actually visited a physical bank in the last month, thanks to the ease of mobile banking. 1. Good: They help us find the best deal. Shopping apps are increasingly popular, with the Apigee survey finding that three in four smartphone users rely on shopping apps. Find&Save, for example, helps connect users to local deals by digitizing newspaper circular ads and making it easy for users to share their findings with friends. 2. Good: They help us track our money. A slew of personal finance apps offer budgeting assistance (like mint.com's app) and even on-the-spot decision-making advice (like an app called Can I Buy?). It's easier than ever to get alerts when you're about to go over budget and to log into your bank account on the go, to review account statements and track deposits (or even deposit checks from your phone). 3. Good: They connect us with expert advice. Thanks to dozens of new startups, your newest (automated) financial adviser is just a few clicks away. A report from the research company Corporate Insight released last fall identified a boom in startups that aim to meet the growing demand for financial advice and management when it comes to investing, retirement planning and other financial adviser-related roles. Many of these startups, including SigFig and LearnVest, also come in app form. 4. Bad: They make it easy for kids to access stuff they shouldn't, including your money. Kidoz, a new app available for Android that prevents kids from misusing their parents' smartphones, found that about four in 10 parents worry about what their children can see when using smartphones or tablets. %VIRTUAL-article-sponsoredlinks%Seeing inappropriate videos or advertisements, using apps that allow in-app purchases and tampering with parents' financial data are among the concerns, says Kidoz CEO Gai Havkin. 5. Bad: They open us up to security risks. If your phone automatically connects to a public Wi-Fi signal, a thief could steal data you are transmitting. Similarly, purchasing from a browser or app is so easy to do that people sometimes make the mistake of sending their credit card data over unsecured connections or illegitimate websites. The fact that so much personal and financial data is stored on our phones also can cause major problems if we lose our phone or it gets stolen. Using password protection can help add an extra layer of security. 6. Bad: They waste our time. Do we really need to obsessively check how many steps we take each day, via the Fitbit app? Or count how many calories we've consumed, care of one of the many dieting apps? Or check every Twitter and Facebook update while we're waiting in line at the bank or on the way home? Apps can take up a lot of time, and the degree to which they are improving our lives is debatable. Still, Kirschner insists the impact is net positive. Take friendships, for example. He notes that the Apigee survey found about 40 percent of people across all age groups use apps to stay in touch with friends, via social apps such as Facebook, Twitter or Snapchat. Sure, some of us might not need to check status updates as often as we do, but those apps help build our sense of social connection. Plus, how else would you find out when your friends get engaged or have babies?